Ladyblush: Coloured Mascara.. is back ! 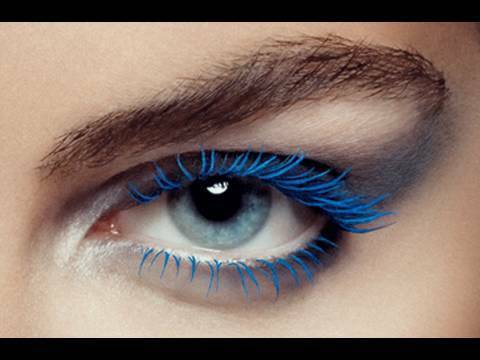 Colored mascara is back and the idea of combing colour onto eyelashes is fun and unexpected. The good news is that you can interpret this trend any way that feels right for you. Classic gals might like subtle colors not too far from brown, like cinnamon, russet, coffee or auburn. More boisterous types might go for brighter shades like magenta, emerald or pink. Tips for brown eyes - the green mascara! green mascara looks best on hazel or brown eyes , it lightens the eye color. If you're still a little hesitant about Technicolor lashes, apply your usual black or brown mascara and then put the colored mascara just on the tips of the lashes. Or try a shade that has a black base — this will give you a hint of color that's only apparent when the light hits your lashes just right. purple mascara is one of their best-selling colors. That's good news for girls with green eyes, because it happens to be the hue that looks best on them. It's a great way to add color quickly to the eye, especially if you are in a rush and don't have any time to create a full eyeshadow look.